Can you give us a quick rundown of the plot? Who would be ruthless enough to do that? A man who lost his entire family in a U.S. Special Forces raid that went tragically wrong. He is Jiménez “Jimmy” Garcia, the psychopathic chief enforcer of a Mexican narcotics cartel. He got hold of the doomsday weapon at the center of this story, and he intends to use it against millions of Americans to avenge our military’s killing of his family. He doesn’t care that it was an accident; he wants blood and he wants it now. These bombs will guarantee that. It is interesting that Joaquin “El Chapo” Guzman, the notorious Mexican drug kingpin, was recently named Chicago’s “Public Enemy No. 1” after breaking out of prison through an underground tunnel. Was he an influence on the character of Jimmy Garcia? Not directly—Jimmy is his own brand of evil. But the real-life cartels in Mexico and other nations are commanded by brutes like El Chapo, so indirectly, yes, Guzman and all the narcotics jéfes served as role models for the monstrous acts of Jimmy Garcia. Tell us a bit about Superstition Davis, the heroine of The Fury. How does she get involved in all of this? Sue is a veteran Chicago cop. She has chocolate hair and violet eyes. She’s tough, intelligent, and well-seasoned. She’s married to her grade school sweetheart, Derek Davis. She has a talent for, and thoroughly enjoys, undercover work, so one night she worked as a “prostitute” in stiletto heels and a bright orange dress, targeting johns for her vice squad. Derek, a Chicago Police SWAT sniper, was on temporary assignment that week to the U.S. Border Patrol in Arizona. Sue and Derek wound up in gunfights when bad guys attacked them in Chicago and Arizona. Sue won. Derek didn’t. Sue believes in vengeance as much as Jimmy Garcia does, and when she found out who killed her dearly beloved, she was off to the races. Is there a “real life” Superstition Davis? Any cop risking his or her life working undercover is a real-life Superstition Davis. But my Sue was born entirely of my overly caffeinated imagination. Who helps her along the way? The FBI, the CIA, the White House, the Border Patrol, and her supervising lieutenant at the Chicago Police Department, who joins the federal team to watch her back because he doesn’t trust feds to fold laundry, much less protect one of his people. Each agency is represented by a secondary character whom is fierce, funny, sarcastic, tough, and full of wisecracks. They are secondary only because they don’t get as much “face time” as the star of the show; each of them is strong enough to star in his or her own book. Hmm . . . Your book features many flashbacks that detail the development of the real-life chemical weapon, VX Nerve Gas, which is central to the plot. How difficult was it writing fictionalized versions of real historical figures and events? It wasn’t difficult because the real history of building VX weapons is fascinating, and the real-life characters and places I met along the way remain legendary: Franklin Roosevelt, Richard Nixon, Adolf Hitler, German chemists, concentration camps, the Eagle’s Nest in the Bavarian Alps, the Arizona/Mexico borderlands, Japan’s secret human experimentation lab in Manchuria, Hezbollah terrorists who even today help the Mexican cartels dig tunnels under the border to deliver narcotics into the U.S., the brave men who captained the WWII Liberty cargo ships that blew to pieces under their feet. I did get a lot of eyestrain, though—as much as I love World War II and the Cold War as historical periods, spending hundreds of hours poring over documents to get my fictional facts right took forever. You grew up in Illinois. What inspired you to start writing and how much has your locale influenced your style? Chicago is a big city filled with saints, sinners, winners, whiners, and most of all, ordinary people who are hard-working, generous, fiercely loyal to friends and family, and quick to punch out anyone who crosses them. My writing reflects that earthy directness. As for who inspired me to start writing, well, that would be Mrs. Feeley, my second grade teacher. She spent a few hours one day telling us about newspapers and about how important they are to citizens of a free nation. I was fascinated that people were paid to travel the world and write about events as they happened, from wars to crimes to natural disasters to sports. I vowed that very day I would become a newspaperman . . . and I did, my first paid gig being a sportswriter for the hometown weekly. But I also loved reading crime novels and thrillers, and thought I might someday give that a try. “Someday” came after I’d chased news for a quarter of a century and decided it was time to create my own worlds. So I left the Chicago Sun-Times (and a perfectly good weekly paycheck!) to write crime thrillers. Growing up, my parents were proud I wanted to write for a living, though they worried privately it wouldn’t be “secure” like working for a city or corporation. If I had gone into, say, poetry, they would have worried a ton. Since I chose newspapers, which in the Eighties were big, powerful, and immensely profitable, their minds were at ease because I could pay the rent. And my wife, Jerrle, was my No. 1 champion when I decided to leave newspapers for fiction—even though it meant a 50 percent cut in our family income until I became established. So yes, my family and friends were, and are, incredibly supportive of my efforts. You sound like you had a good thing going with journalism. Why did you switch to writing fiction? After twenty-five years, I found myself writing the same headlines over and over: Bank Buys Bank. Ten Die In Fire. Governor Sent to Prison. Cubs Blow It In Ninth Inning. I was faced with being mildly bored the rest of my working life, or trying something new. I chose to go for the different and fun, and I’m glad I did. It’s a great career, writing books, and the newspaper industry I loved so much has collapsed so completely there are few good jobs left. I love reading them, so I assumed I’d love writing them. Fortunately, I was right. My first reading foray was comic books, with The Metal Men and Sergeant Fury and His Howling Commandos my absolute raving favorites. (I hated Archie, though. Hated. Him.) Then came “Franklin W. Dixon,” author of The Hardy Boys series. 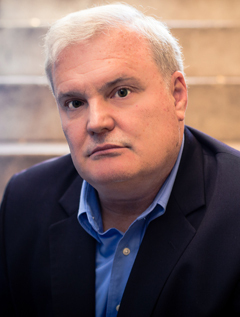 (I use quotes because “Franklin W. Dixon” was the fictional pseudonym for the posse of freelancers hired by the publisher to write the various books.) Then Mickey Spillane and his iconic Mike Hammer, which led to Raymond Chandler and other private-eye books. Besides the aforementioned Morrell and Berry, I like John Sandford, James Lee Burke, Michael Connelley, Lee Child, Allison Brennan, Toni McGee Causey, Gayle Lynds, and my most recent discovery, Alex Berenson. But there are literally a hundred other writers I follow because they write so damn well. I learn a lot about the craft by reading other writers’ works, and I just plain love reading their thrillers. What else can you recommend for fans of The Fury? The three books I published before The Fury, which are, in order, Blown Away, Cut to the Bone, and Torn Apart. They were out of print for a time, but now have been republished in jazzy-looking eBooks and print editions. (You can order them from Amazon, Barnes & Noble, and other booksellers, just like The Fury.) Those three books make up my cops-vs.-serial killers series, which I set in the Chicago suburb of Naperville, where I live. They became national bestsellers, were published in German, Chinese, Turkish, and Slovakian, and won significant national recognition. I recommend reading them in order, because the stories feature the same group of Naperville police officers whose lives change for good or ill with each new attack of a serial killer. The stories are as much about the characters as the crimes. I have a very cool idea for a new lead protagonist—male this time, instead of the females that lead The Fury and the trilogy—and his desperate battle to stop a domestic terror group bent on raising hell on U.S. soil. With any luck, I can figure out a way for Superstition Davis to join him, since readers like Sue so much. Shane, thank you for joining us today! You’re welcome, and as I said before, it’s a true honor to be here today. Visit www.tantor.com for The Fury in print, e-book, and audio as well as thousands of other books. 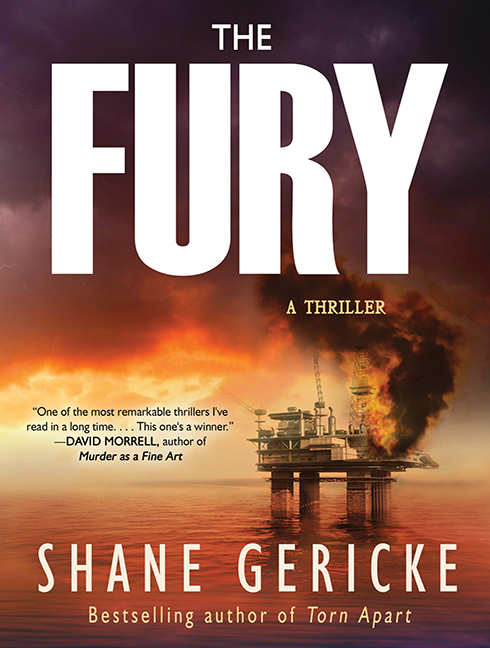 For more information on Shane Gericke, The Fury, and Shane’s other works, please visit www.shanegericke.com or www.thefurybook.com.